A plan to designate one of the potential sites for a new public high school as a historic district will be discussed by the County Board tonight (Tuesday). But the proposal has drawn skepticism from county and Arlington Public Schools staff, who want the Board to deny the request and instead help preserve flexibility for APS as it solves its capacity issues. The Education Center at 1426 N. Quincy Street is one of three remaining options for the county’s next public high school — not counting a new option involving the center, floated by superintendent Patrick Murphy. 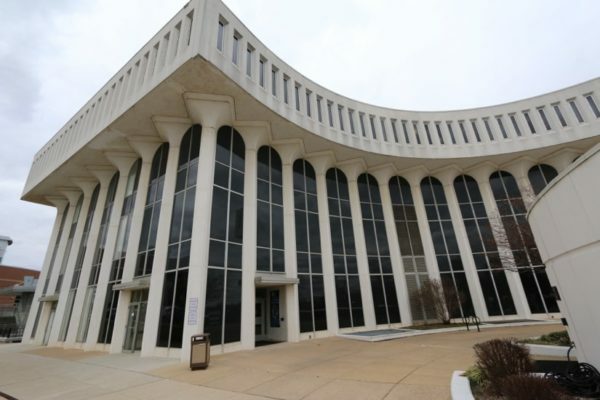 Under the plan for historic designation, the Education Center and the adjacent David M. Brown Planetarium would be saved from possible demolition and subject to a strict design review process for any changes to its exterior. The request for historic designation came from local resident and Planning Commission member Nancy Iacomini, who described both 1960s-era buildings as “physical embodiments of the forward thinking of Arlington and our County’s hope for the future” in her nominating letter. Preservation Arlington said in a blog post that the buildings are examples of “New Formalism,” which combined classical and more modern design elements. Both were completed in 1969, after being funded through a 1965 bond referendum. That is a view echoed by School Board chair Nancy Van Doren, who in a brief letter to County Board chair Jay Fisette expressed the School Board’s opposition to the plan. “School Board members do not support pursuing historic designation of the building at this time as it would limit options to address the school division’s capacity needs at this site,” Van Doren wrote. In a previous column, Peter Rousselot argued against the historic designation, and noted that APS is moving its administrative staff out of the building to new offices at Sequoia Plaza 2 on Washington Blvd. The School Board approved the move at its meeting last week. Staff recommended finding that the site meet some of the criteria for historic designation but that further evaluation be shelved. They also proposed denying the request and collaborating in the future to see how the site can be reused.